C & I ate relatively healthy while we were in London (we didn't want to make ourselves miserable too early on in the trip) but when we got to Paris, things started to go south. As in, I ripped my skinny jeans one morning after eating a few too many croissants. Whoops! The French don't really eat an "American" breakfast; instead, they have an espresso with a baguette. I quickly adapted to their way of eating and enjoyed carbs on carbs on carbs all day everyday. Can you blame me? Now, let's get down to the details! • Take the Chunnel if you're coming from London. Traveling with Eurostar was the easiest, most comfortable and enjoyable experience. I can't recommend it enough! • Know Basic French words like hello, thank you, sorry and excuse me. Also learn how to say "excuse my French." This was our first ever trip with a major language barrier (other than Spanish) and it was difficult! Some people were very willing to help and work with you, but others were flat out rude and they made it very obvious how annoyed they were. We always tried to start every conversation with "Excuse my French," instead of "Do you speak English" - it just seemed more polite! We were in their country, after all. • Take the Metro but be prepared to walk a lot! Metro tickets in Paris come as single ride tickets (we bought them in packs of ten) so we didn't want to waist a ticket if we didn't have to. That meant lots of walking! Also, if you do take the Metro, don't throw your ticket out until you've exited. They have stationed guards at some stations to check tickets when you switch trains! • Order a Cafe au Lait - it seemed to be the simplest way to order coffee with cream with zero miscommunication. • Buy Tickets Early if you plan to see the sights! Lines are long and tickets can sell out in advance. Also, arrive early to said attractions for a shorter wait time/fewer people. • Order Tap Water unless you want to be charged for bottled or sparkling. • Make sure your hair tools have the appropriate voltage for European sockets (and make sure you have plug adaptors). LOL at my experience in London. Top (old), love This One or This One | Skinny Jeans (size down) | Rose Gold Monogram Necklace | Similar Moto Jacket | Sunnies (sold out), Similar Here, Also Love These | Vince Camuto Purse (sold out) Similar Here for 40% off! 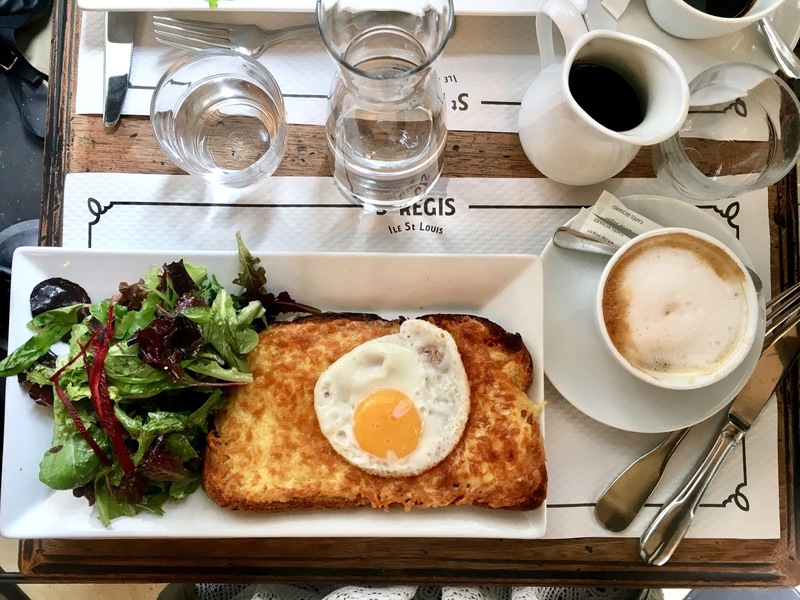 • Café Saint Régis - a delicious breakfast in an adorable corner cafe! The waiters were nice enough, the coffee was fantastic and the food was great! I ordered a croque madame and couldn't have been happier. 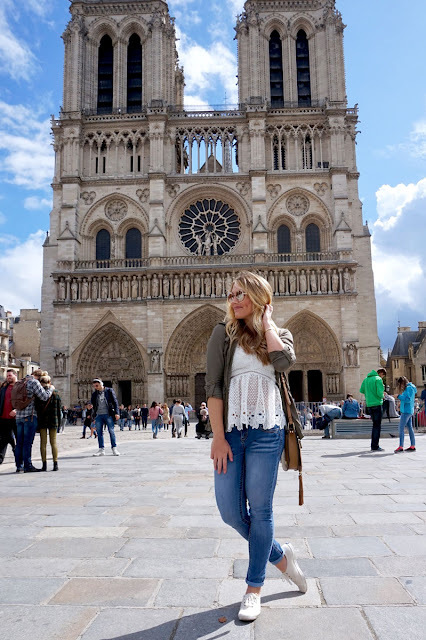 It is very close to Notre Dame, just FYI! • Bistro Belhara - probably our nicest meal in all of Europe! The waiters didn't speak much English so the language barrier caused a little confusion (we didn't get the dessert we paid for....) BUT the food was absolutely scrumptious and the waiters were friendly and excited to help us. The corn chowder was to.die.for and the squid ink orzo topped with octopus was out of this world. I would highly recommend it for a fancy French dinner, but be sure to make reservations because its very small! • Café Du Marché - this meal was great simply because of the experience! 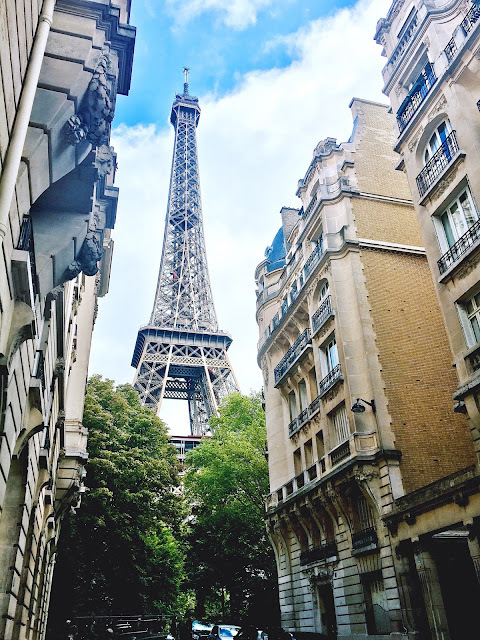 We stopped by after climbing the Eiffel Tower, sat on the street patio and soaked up the Parisian lifestyle. I ordered a meat and cheese plate, C ordered beef tartare and we split escargot. It was so enjoyable! 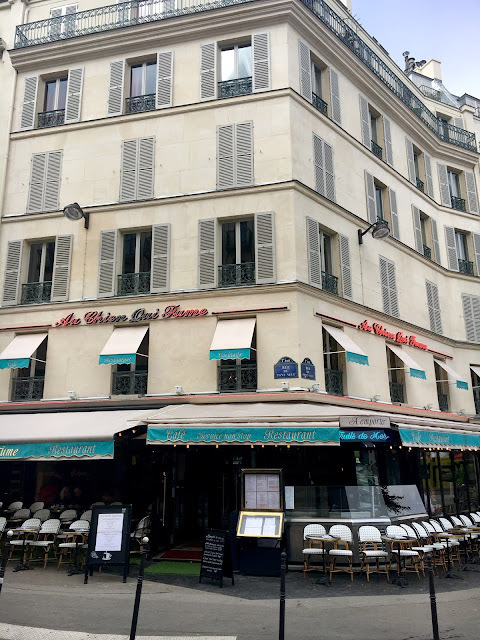 • Au Chien Qui Fume - we stumbled upon this restaurant a few blocks from where we stayed and ate here unplanned and in a hurry. It ended up being one of our best meals! We split the farm chicken and mushroom casserole (which is nothing like what I envisioned or what I think of as casserole) and it was delicious. Our waitress was so friendly and welcoming, even though she didn't speak much English. It was a nice change from the wait staff at other places! • Angelina Hot Chocolate - I heard so many things about Parisian hot chocolate so I had to try it out for myself! It definitely lived up to the hype - it was basically like a melted chocolate bar in a cup. I don't even want to know how many calories I drank that day..... it was so rich, decadent and scrumptious but it definitely left you wanting some ice water! Pro tip: if you're only going for the hot chocolate and are OK with a to-go cup instead of sipping it at a table, you can skip the [very long] line! • Pierre Hermé v Ladurée - supposedly there is a bit of a rivalry between these two pastry shops! 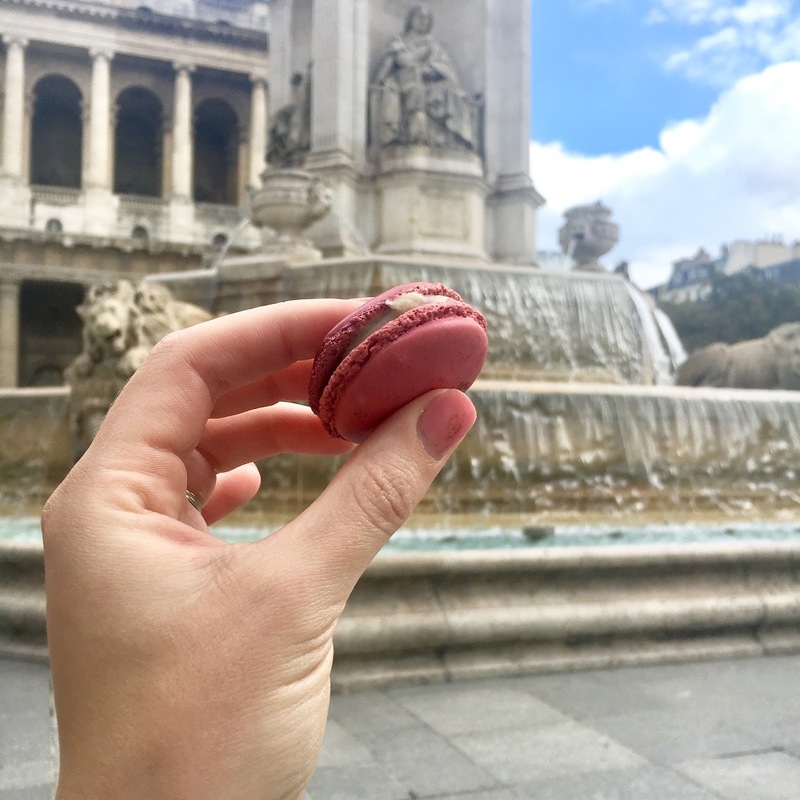 Everyone says you should try the macarons at both places and choose for yourself. I think I'd lean towards Ladurée, but C chose Pierre Hermé! If we're being honest, though, you really can't go wrong with either. The unique flavors will send your taste buds to heaven and back. • Crepes. All the crepes! There are street vendors everywhere selling them and you literally can't go wrong. 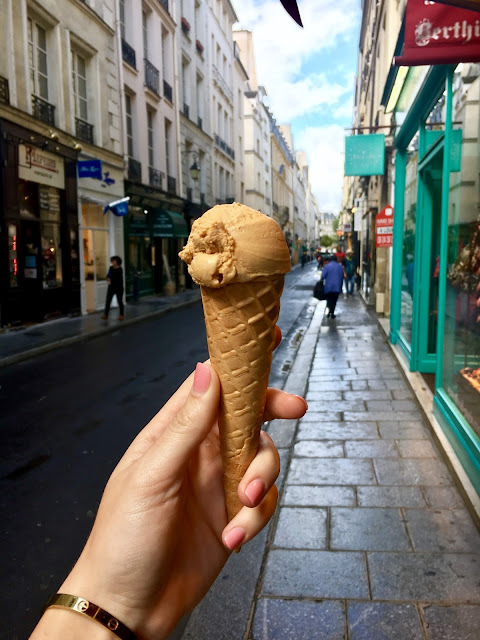 My favorite (probably my favorite dessert/snack in all of Paris) was a speculoos cookie butter crepe that I got in front of Moulin Rouge in Montmarte. I was in the middle of a very hangry moment and it cured me. • Berthillon - the best ice cream in Paris - need I say more? I heard the lines around the ice cream parlor itself can get kind of long, but that most restaurants nearby also sell the same ice cream with no wait. We literally ate ice cream for breakfast dessert and had no line, so that's a good option, too, ha! • Notre Dame - the detailing in the architecture is astounding! I personally enjoyed the back of the church more than the front. If you want to tour the cathedral, get there early because the lines are intense. 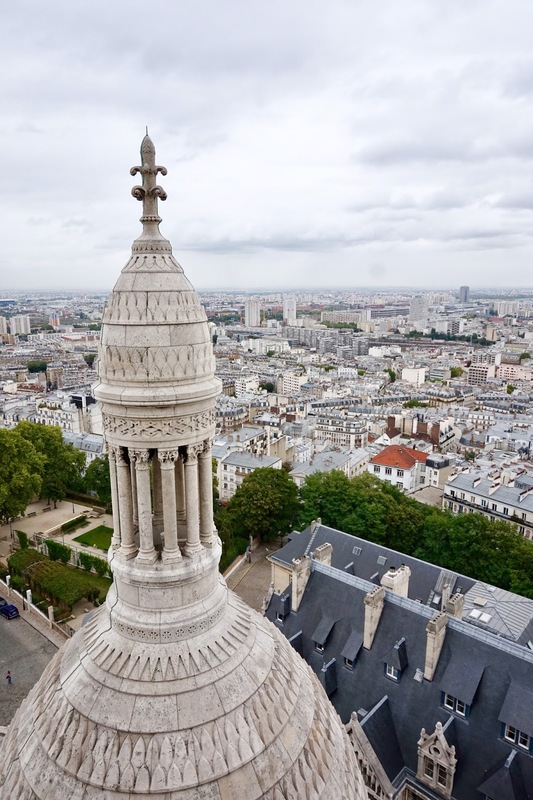 • Sacre-Coeur (Sacred Heart) - the best view in Paris, IMO. This church is located in the Montmarte neighborhood and sits on top of a very big hill. It has free entry and is pretty crowded at the entrance, but hardly anyone braves the 300 steps to the top of the dome. It was slightly claustrophobic climbing a steep winding staircase, but it was totally worth it! • Eiffel Tower - a Paris must! There is a long line to get through security, but it moves relatively quickly. Once you are in the park, you can either wait in a slower and longer line to take the elevator to the middle floor and then the top floor, OR you can take the steps to the middle floor (its cheaper and there is no wait). It was a bucket list item for me to climb the steps, so climb we did. 674 steps later (at least by my count) we made it! I think the second/middle floor was plenty high, no need to spend the extra time and money to go all the way up unless you just want to. • Arc de Triomphe - one of the most famous monuments in Paris! Again, the detailing and architecture was absolutely insane. The arc is located in the middle of a gigantic round-about - you have to take the tunnel underneath the street to get to it. You can climb to the top, if you choose. It stands at the western end of Champs-Élysées and has a beautiful view! 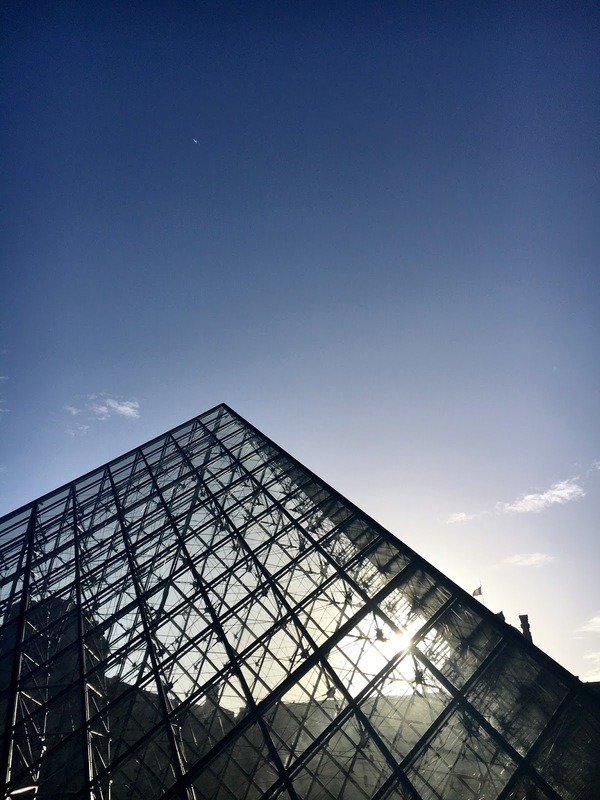 • The Louvre - I can't even begin to express how massive this museum is! It is completely overwhelming. I don't appreciate art or museums, so it wasn't really my cup of tea, but still, a Paris must. Pro tip: the Louvre is open late on certain evenings and I hear it is much less busy then. Buy your tickets in advance - the ticket lines are always let through security before the non-ticket lines, so you could be stuck waiting for hours if you're not prepared! • Montmarte - the prettiest neighborhood! We were a little rushed, tired, lost, and stuck in a rainstorm without an umbrella when we were here.... I'm sad that I didn't get to fully enjoy it. The winding cobblestone streets up to the Sacre-Coeur Basilica are so historic - Moulin Rouge is located at the base of the hill and totally worth a photo-op. I think I need to go back just to experience it the right way! At the top of the "Sacred Heart" or Sacre-Coeur Dome | V-Neck T (so soft - a must have!) | Leggings | Similar Leopard Cardi, also LOVE this grey version! The Eiffel Tower - duh! The views from the second floor of the Eiffel Tower | Top (old), love This One or This One | Skinny Jeans (size down) | Rose Gold Monogram Necklace | Similar Moto Jacket | Sunnies (sold out), Similar Here, Also Love These | Vince Camuto Purse (sold out) Similar Here for 40% off! The Arc de Triomphe | Top (old), love This One or This One | Skinny Jeans (size down) | Nikes | Rose Gold Monogram Necklace | Similar Moto Jacket | Sunnies (sold out), Similar Here, Also Love These | Vince Camuto Purse (sold out) Similar Here for 40% off! • Champs Élysées - THE shopping street of Paris! It stretches two kilometers (so a little over a mile) between the Louvre, through the Tuilerie Gardens (worth a stop) to the Arc de Triomphe. It is one of the most famous streets in the world! I would compare it to a combination of 5th Avenue and Times Square in NYC - high-end designer stores mixed with big name retailers and TONS OF PEOPLE. The stores were so crowded - Louis Vuitton even had a line with security! 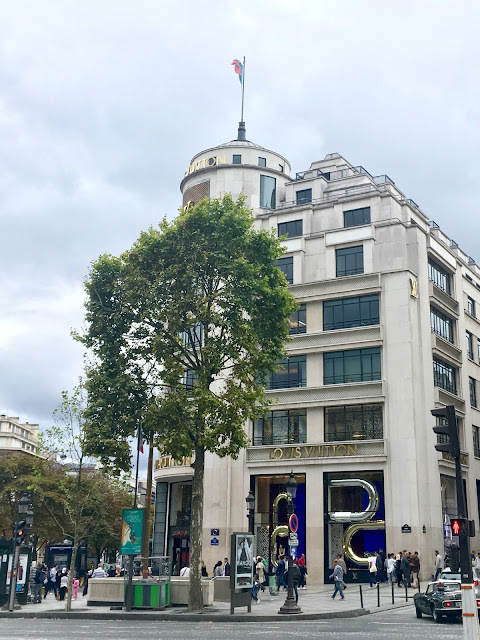 • Le Bon Marché - unfortunately we didn't have enough time to make it to this Parisian department store, but I hear its incredible! 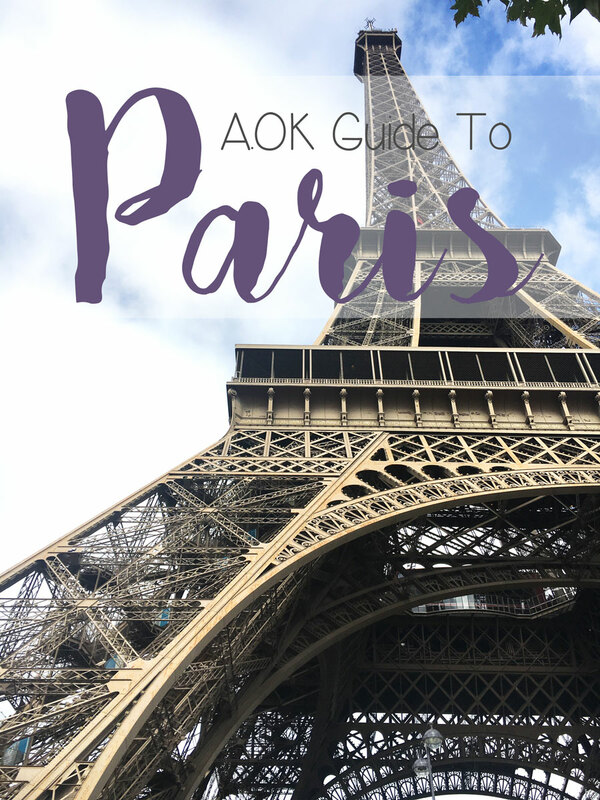 Like Saks on Steroids yet very Parisian and tourist-free. • Galeries Lafayette - another Parisian department store that is totally worth visiting just for a photo of the glass ceiling. Google it, it is beautiful! I can only speak from experience, so maybe check with other sources who have more knowledge, BUT, we stayed a few blocks away from the Louvre in the 1st Arrondissement and found it to be very convenient. 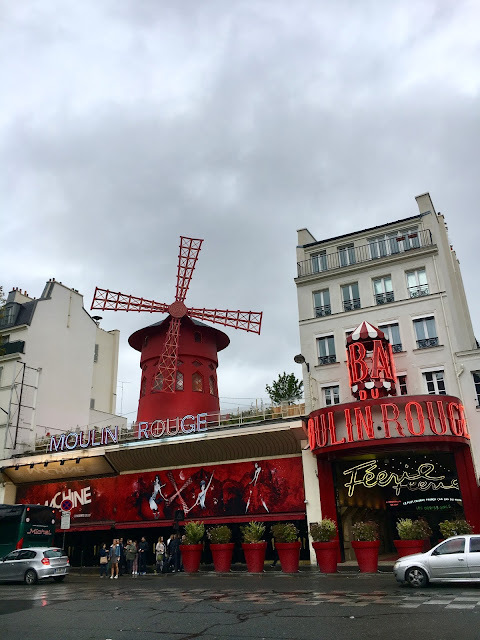 It was lively during the day but quiet at night, located within walking distance of two Metro stops and multiple attractions (like the Palais Royale) and cute as can be. 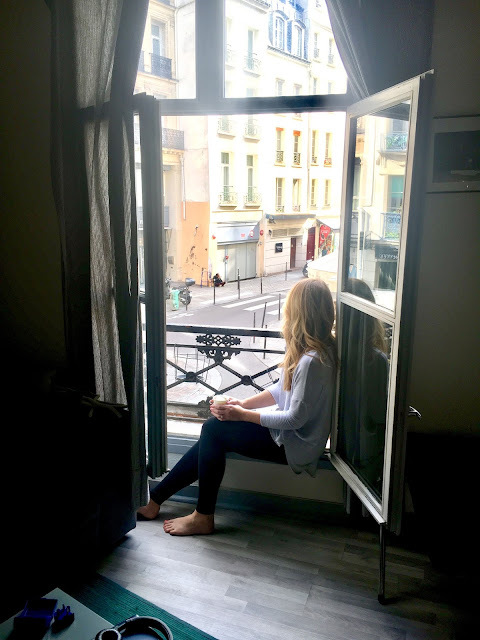 It is one of the oldest neighborhoods in Paris - we learned that the intersection by our AirBNB (the one seen in both photos below) used to be one of the main cross streets in the city and they beheaded people there....WHAT! 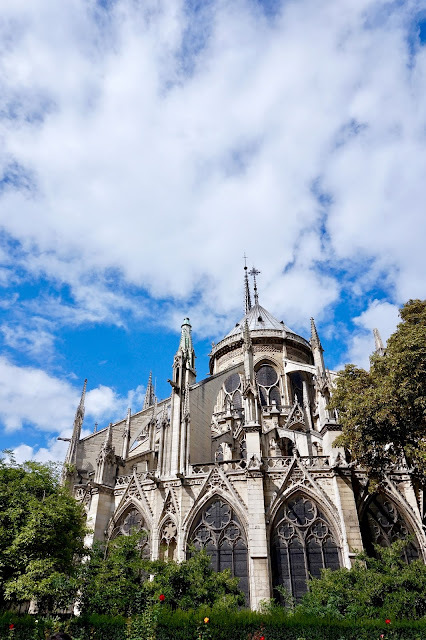 Overall, Paris was our least favorite city out of the three we visited -- but that being said, it is still a wonderful destination and one that I would go back to! I think I had too high of expectations - many people talk about Paris as being magical, romantic, the best food and fashion in the world, etc......it was a lot to live up to! In my opinion, Paris was kind of like the European version of New York City. It was kind of dirty, there was a lot of graffiti everywhere, it was really busy and people are kind of standoffish. BUT, it has a lot of history, beautiful architecture and great sights! The longer we've been home the more I've been thinking about Paris and wanting to go back. It had some tough competition being the mid-way stop between London and Rome. Also, I think we tried to squeeze too much into our time there - we ended up being rushed and not enjoying it as much as we should have. 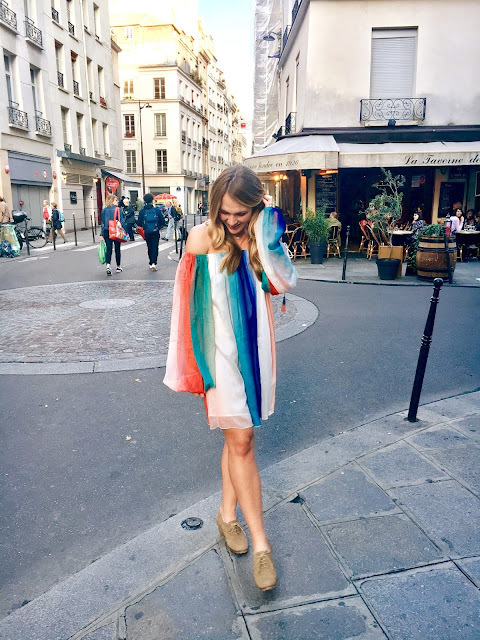 I think meandering down the streets and stopping at random cafes for a glass of wine and some bread sounds much more fun than hurrying between sights! All the more reason to go back, right?! Have you been to Paris? What are your thoughts and favorite spots? I'd love to hear! Ahh this looked AMAZING! I am hoping to take a Euro trip for my hubby grad. Studied abroad in college one summer and got to visit Paris and loved it. I want to go back. That's so cool! This was my first trip, I'm kicking myself for not studying abroad when I had the chance!